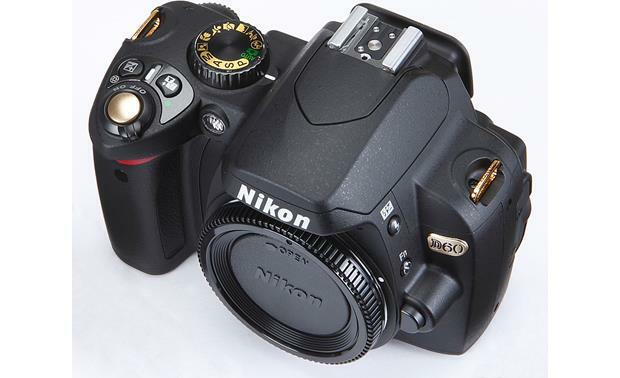 Nikon took their highly popular D60 SLR and gave it a classy new look. 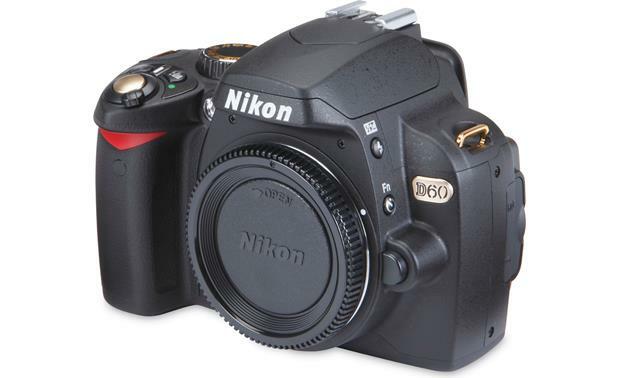 Nikon took their highly popular D60 SLR and gave it a classy new look. This Special Edition model features rich, gold accents and a special Gold Edition neck strap. The camera's 10.2-megapixel image sensor and sophisticated processing team up for beautiful high-res pictures. Plus its lightweight, user-friendly design makes digital SLR photography fun and easy. If you've ever missed a perfect photo opportunity because your digital camera just couldn't keep up, you'll appreciate the D60's quickness. Its near-instant startup time, split-second shutter response, and speedy autofocus make it ready to snap crisp, in-focus shots almost as soon as you turn it on. Save your photos to optional SD memory cards (no memory included). The D60's self-cleaning sensor unit vibrates to efficiently remove dust from its surface  ensuring that your images remain spot-free. A special airflow control system also helps to divert any dust inside the camera away from the sensor  preventing particles from settling on interior surfaces. 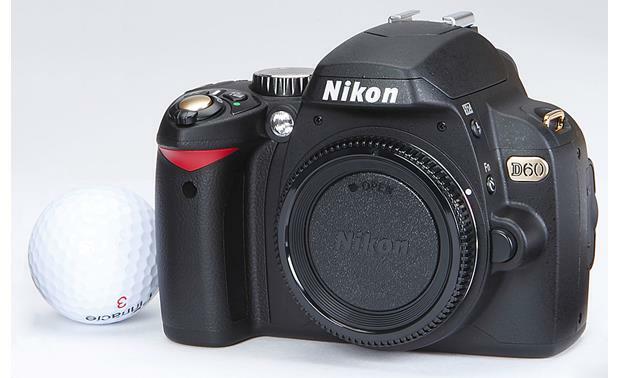 Nikon's thoughtful design and attention to detail make the D60 a pleasure to operate. The large, crisp 2-1/2" LCD monitor gives you a clear view of the pictures you've taken. When you turn the camera upright to shoot a tall subject, the menus automatically rotate for easy viewing. And Nikon's handy "Help" function lets you read a brief explanation of the custom functions on the camera  great for folks who are just getting the hang of advanced photography, and for experts who don't want to carry around the manual. Fully automatic and preset shooting modes make it super-easy to capture vivid, accurately exposed photographs. Use Nikon's Active D-Lighting in tricky, high-contrast lighting conditions. This mode preserves important photographic details that otherwise might be washed out in brightly lit areas of your picture, or lost in deeply shadowed ones. A wide variety of in-camera options let you retouch and enhance the look of your images, while leaving the original picture file intact. There's even a fun shooting mode that lets you create a stop-motion movie from a series of consecutive photos. weight (with battery): 18.8 oz. LCD Monitor: The Nikon D60 has a 2.5" low-temperature polysilicon TFT LCD monitor featuring approximately 230,000 pixels and adjustable brightness and allows up to 170-degree viewing angle. The large 2.5-inch LCD monitor enables image preview at up to 19 times magnification and has large type fonts with easy-to-view menus. Auto rotating LCD display provides automatic horizontal and vertical graphic display orientation. The camera's LCD monitor is for playback use only and to display shooting information such as shutter speed, aperture, and number of exposures remaining as well as the settings currently applied. Optical Viewfinder With Eye Sensor: The D60 uses a fixed eye-level penta-Dash miror single-lens rflex viewfinder with a built-in diopter adjustment. By adjusting the diopter to suit your eyesight (with or without eyeglasses), the viewfinder image will look clearer. The viewfinder's coverage area is approximately 95%. The optical viewfinder features an Eye Sensor which activates every time you thorugh the viewfinder, turning off the information display on the LCD for comfortable shooting and to reduce battery drain. During self-timer or remote control operation when your eye does not cover the viewfinder eyepiece, stray light may enter the eyepiece and affect the exposure when the image is captured. To prevent this, you can use the supplied eyepiece cap to cover the eyepiece. Recording Media And Image Size: The camera records photographs on Secure Digital (SD) and SDHC memory cards up to 8GB (sold separately). The D60 records still images in JPEG and NEF (RAW) formats. You can choose from the following Image Quality and Image Size settings. NEF (Raw) 3872 x 2592 NEF Raw CCD data is saved directly to the memory card in compressed Nikon Electronic format (NEF). Only available in 3872 x 2592 image size. S: 1936 x 1296 JPEG Fine image quality, suitable for enlargements or high-quality prints. (1:16) JPEG Basic image quality, suitable for pictures that will be distributed by e-mail or used in web pages. Image Sensor: The D60 features a 23.6 mm x 15.8 mm Nikon SLR DX format image sensor with a total pixel count of approximately 10.75 million pixels and an effective pixel count of approximately 10.2 million. Nikon SLR DX format image sensors incorporate individual micro-optics on each of the sensors pixels. Micro Optics construction ensures that the image from the camera's lens will be precisely aligned with each pixel's sensor and that performance will be optimized. Active Dust Reduction System: Nikon's Active Dust Reduction System activates automatically, along with Airflow Control technology to reduce the amount of dust that reaches the sensor. Fast Start-Up: The D60 features a fast 0.19-second startup for split-second shooting so you can be confident you you will never miss a photo opportunity. AF-A: This feature automatically selects single-servo autofocus when subject is stationary and continuous servo autofocus when subject is moving. The shutter can only be released when in-focus indicator is displayed. Single-servo Autofocus (AF-S): This feature is used with stationary subjects. Focus locks when shutter-release button is pressed halfway. The shutter can only be released when in-focus indication is displayed. Continuous-servo Autofocus (AF-C): The camera focuses continuously while the shutter-release button is pressed halfway. Photographs can be taken whether or not the camera is in focus. AF Assist Illuminator: The built-in AF assist illuminator enables the camera to focus even when the subject is poorly lit. This feature will light automatically to assist the autofocus operation when the shutter release button is pressed halfway. It has an operating range of 1'8" to 9'10". Closet Subject: Camera automatically selects focus point containing subject closet to camera. Dynamic Area: The camera focuses on subject in the selected area, but follows the subject if it moves from its original position, shifting instantly and automatically to the focus area into which the subject has moved. Manual Focus Point: The focus point can be selected manually for composing photographs in which the main subject is not postiioned at the center of the frame. Focus Lock: Focus Lock can be used to change the composition after focusing, making it possible to focus on a subject that will not be in one of the five focus areas in the final composition. Electronic Ranger Finder: If the lens has a maximum aperture of f/5.6 or faster, the camera's viewfinder focus indicator can be used to confirm whether the portion of the subject in the selected focus point is in focus. Two-Stage Shutter-Release Button: The camera is equipped with a two-stage shutter-release button. To focus, press the shutter-release button halfway, stopping when you fell resistance. Focus will lock while the shutter-release button is held in this position. To release the shutter and shoot, press the shutter-release button the rest of the way down. The camera features the following Shutter-Release Modes. Continuous: The camera records photographs up to 3 frames per second while the shutter release button is held down. In this mode, you can get continuous bursts of up to100 JPEG images. The fast framing rates that contribute to the ability to capture moments in time instantly, along with high-speed buffer memory handling, fast image processing, high-speed SD memory card access and large system bus bandwidth help to make this feature possible. Self-timer: This mode can be used to reduce camera shake or for self-portraits. The shutter is released about 2, 5, 10 or 20 seconds after shutter-release button is pressed depending on setting. Nikon 3D Color Matrix Metering II: The D60's 3D Color Matrix Metering II evaluates each scene for brightness, color, contrast, size and position of shadows and highlights, selected focus area and camera-to-subject distance, comparing that information against an onboard database of more than 30,000 actual photographic scenes. The result delivers instantly and precisely determined exposures for each scene, even in challenging lighting conditions. 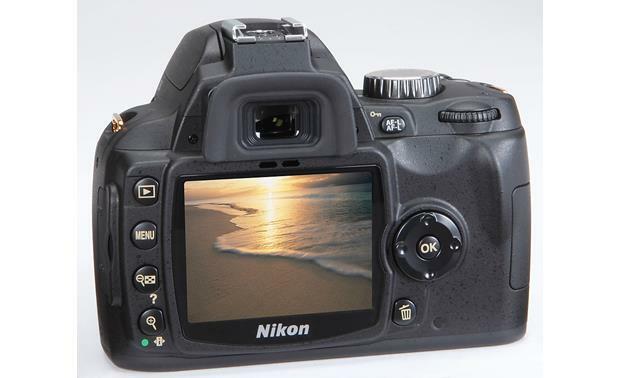 Digital-Vari Program Automatic Shooting Modes: The Nikon Digital SLR Camera includes the following 8 Digital Vari-Program Modes: Auto, Auto Flash-OFF, Portrait, Landscape, Child, Sports, Close Up and Night Portrait. Each of which adjusts automatically for optimal results for everyday shooting situations. Each mode considers lighting conditions and possibilities, aperture, shutter speed, white balance, hue, tone, sharpening and more to make creative photography as simple as rotating the mode dial. The camera also features three additional semi-auto modes and one manual mode. Portrait: Keeps your main subject in sharp focus with a soft background for more pleasing portraits. Landscape: Ideal for beautiful scenery with great perspectives and optimized greens and blues. Child: Delivers fresh, natural skin tones for stunning shots of children. Clothing also vividly rendered. Sports: Freezes fast-moving subjects easily. Close Up: Find beauty in small details by focusing sharply on a small area with a softly blurred background. Ideal for flowers and coins or other small treasures. Night Portrait: Capture your main subject in low light while retaining a natural looking background exposure. Metering: You can choose from the following Metering Modes to determine how the camera sets exposure. Matrix: The camera meters a wide area of the frame and instantly sets exposure according to distribution of brightness, color, distance and composition for natural results. Center-weighted: The camera meters the entire frame but assigns greatest weight to center area. Spot: The camera meters exposure in active focus point only. This ensures that the subject will be correctly exposed, even when background is much brighter or darker. AE/AF Lock: If your subject is off-centered in the frame, it can become difficult to achieve proper exposure and focus. By engaging the AE/AF Lock feature, you can focus and meter on your subject, lock the exposure and focus by pressing the shutter release button halfway, then recompose your shot before taking the picture. You can choose from the following AE/AF Lock settings. Noise Reduction: This option controls whether photographs taken at high sensitivities or shutter speeds slower than 8 seconds are processed to reduce noise before being recorded to the memory card. Auto: The white balance is automatically adjusted to suit the lighting conditions. Incandescent: This is used under incandescent lighting situations. Fluorescent: This is used for most fluorescent lighting conditions. Direct Sunlight: This is for use with subjects that are under direct sunlight. Flash: This is for use with built-in Speedlight or optional Nikon Speedlights are used. Cloudy: This is used when taking pictures under overcast skies. Shade: This is used under sunny skies when subject is in shade. Preset: A white object is used as reference to set white balance under unusual lighting conditions. Note: In addition to the the basic White Balance options, the camera features advanced White Balance settings for specific types of fluorescent lighting. You can choose from Sodium-vapor lamps, Warm-white fluorescent, White fluorescent, Cool-white fluorescent, Day white fluorescent, Daylight fluorescent, and Mercury-vapor lamps. ISO Sensitivity: When lighting is poor, the camera will automatically increase sensitivity, permitting faster exposures, and minimizing blur caused by inadvertent camera movement, up to a maximum equivalent of ISO 1600. Using the ISO button and main command dial, you can manually select from ISO settings 100 to 1600, with incremental steps of 1EV. You can also choose HI 1 (ISO 3200) for even higher sensitivity. Flash Sync Modes: The camera offers the following flash sync modes depending upon the shooting mode currently selected. Auto: When lighting is poor or the subject is back lit, flash pops up automatically when shutter-release button is pressed halfway. Flash Exposure Compensation: In P, S, A, and M modes, the flash exposure compensation can be used to increase or reduce flash output from the level chosen by the camera's flash control system. The flash exposure compensation can be set to values between -3 EV and +1 EV in increments of 1/3 EV. Accessory Shoe: The camera's integrate accessory shoe located above the viewfinder allows you to connect optional SB-series Speedlights including the SB-400, SB-800, SB-600, SB-80DX, SB-28DX, SB-28, SB-27, SB-23, SB-22S and SB-29S (all sold separately) without a sync cable. Histogram: The D60 features the ability to view a histogram on the LCD monitor screen. A histogram is a graph showing the distribution of tones in the image. Multi-Language Menu: You can choose from one of 15 languages for display of the camera menus and messages including English, French and Spanish. Auto Image Rotation: Photographs taken while this feature is set to "On" allow the image to be played back automatically in the orientation it was taken such as Portrait or Landscape. Rotate Tall: Portrait photos are displayed in tall orientation during playback. Image Review: When this setting is enabled, the camera displays the image on the LCD monitor after the picture is taken. You can choose how long photographs are displayed in the monitor after shooting from 4 seconds, 8 seconds, 20 seconds, 1 minute or 10 minutes. Thumbnail Playback: This feature allows you to view four or nine images at once on the LCD monitor so that you can search for an image quickly. Slide Show: This features plays photographs back in an automatic slide show manner. Playback Zoom: During single-image and thumbnail playback, you can zoom in on the selected image. You can zoom in up to 25x for large images, up to 19x for medium images, and up to 13x for small images. Once the image is enlarged, you can pan through it on the LCD monitor using the multi selector. TV Playback: The camera features a 3.5mm minijack video output plug to playback still images on your TV or monitor using the optional EG-D100 video cable (sold separately). You can select between NTSC or PAL video playback. Quick Retouch: Create retouched copies win which contrast and saturation have been enhanced. D-Lighting: D-Lighting can be used to brighten dark or backlit subjects . Image Trimming: Create cropped copies of existing photos. Image Overlay: Combine two RAW photographs. Before And After: Compare a retouched copy to the source image by displaying them side-by-side. 640 x 480: Suited to television playback. 320 x 240: Suited to display on web pages. 160 x 120: Suitable for email attachments. Sky Light: Creates the effect of a sky light filter, giving the copy a "cold" blue cast. Color Balance: Using this method, you can individually increase the amount of green, red, blue or magenta in the copied images. Stop-Motion Movie: Create a stop-motion movie from photographs on the memory card. You can choose one of the following frame sizes - 640 x 480, 320 x 240, or 160 x 120 and one of the following frame rates - 15 fps, 10 fps, 6 fps, or 3 fps. PictBridge Printing Capability: Using the supplied USB cable, you can connect this camera directly to a PictBridge compliant printer. PictBridge is a new standard that allows you to connect a PictBridge compliant camera directly to a PictBridge compliant printer and make prints, regardless of brand. DPOF: The DPOF feature enables you to create a digital "print order" for PictBridge-compatible printers and other devices that support DPOF. Exif Print (Exif 2.21): The D60 conforms to "Exif Print", a worldwide standard. Vital camera settings (such as: exposure mode, white balance, exposure time) and scene data are recorded to the image file when it is captured. Printers compatible with "Exif Print" are able to use this information to produce high quality photographs, exactly the way they were intended at the time of capture. This intelligent communication process also allows the printer to correct for poor lighting or mistakes, resulting in photos that can be even better than the originals. Li-ion Battery Pack: The long lasting rechargeable Li-ion Battery Pack (EN-EL9) offers up to 500 shots per charge with the 18-55mm VR lens so you can keep shooting. Quick Charger: The camera also comes with an AC Quick Charger (MH-23) to the charge the supplied Li-ion battery pack. The MH-23 will charge the EN-EL9 battery pack in approximately 90 minutes. Backup Battery: The camera's internal backup battery can provide up to a month of backup power after about three days of charging from the EN-EL9 batter pack. Auto Off Timers: This feature allows you to choose how long the monitor and exposure meters remain on when no operations are performed to prevent battery drain. You can choose from the following selections. Custom: allows you to choose the monitor off delay and the image review time from 4 seconds, 8 seconds, 20 seconds, 1 minute or 10 minutes; you can choose the auto meter-off delay from 4 seconds, 8 seconds, 20 seconds, 1 minute or 30 minutes. Optional AC Adapter: Use of the optional EH-5a AC adapter or optional EH-5 AC adapter is recommended for extended playback. USB Connection: The Nikon D60 utilizes a mini-USB high-speed 2.0 connection and come supplied with a USB cable to connect to your PC. Software Suite CD-ROM: The supplied Software Suite CD-ROM contains Nikon Transfer, ViewNX and related software. Nikon Transfer is used to copy (transfer) pictures from the camera to the computer and to perform such other transfer-related functions as making backups and embedding information in pictures as they are transferred. ViewNX is used to view pictures after transfer; among the other tasks it can perform are grouping pictures, restoring and making simple adjustments to NEF (RAW) images and converting the file format. System Requirements: The supplied software will work with Windows and Macintosh. You computer will need to meet the following system requirements.